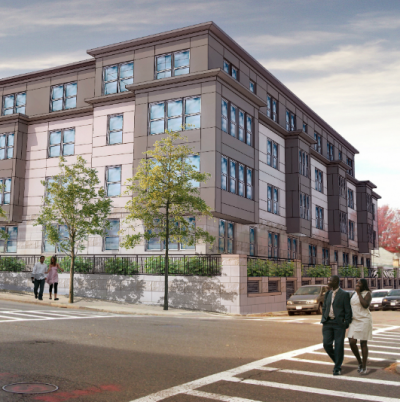 The Boston Redevelopment Authority approved Mattapan’s Cote Village project at its Thursday board meeting, estimating $31.2 million needed for the housing build-out. Of the nine BRA projects approved Thursday, valued at $1.3 billion, the five-story Cote Village housing complex will rise from a the site of a vacant auto dealership on the corner of Cummins Highway and Regis Road. It sits near a planned Fairmount LIne commuter rail stop. According to a BRA statement Friday, the 76-units would include 68 affordable units, 56 of which will be restricted to households at or below 60 percent of area median income (AMI). Another 12 units would be designated for those at or below 80 percent AMI. The remaining eight units are planned as market rate townhouses. Discussion surrounding the housing project has been spirited, including a signature petition urging the developers to scale down the density of the complex. Cote Village is designed by Davis Square Architects and expected to create 76 construction jobs, the BRA said in the announcement. The project will be financed through tax credits and loans, a $750,000 award from the Neighborhood Housing Trust, and $4.8 million from the Inclusionary Development Policy fund, according to the BRA.